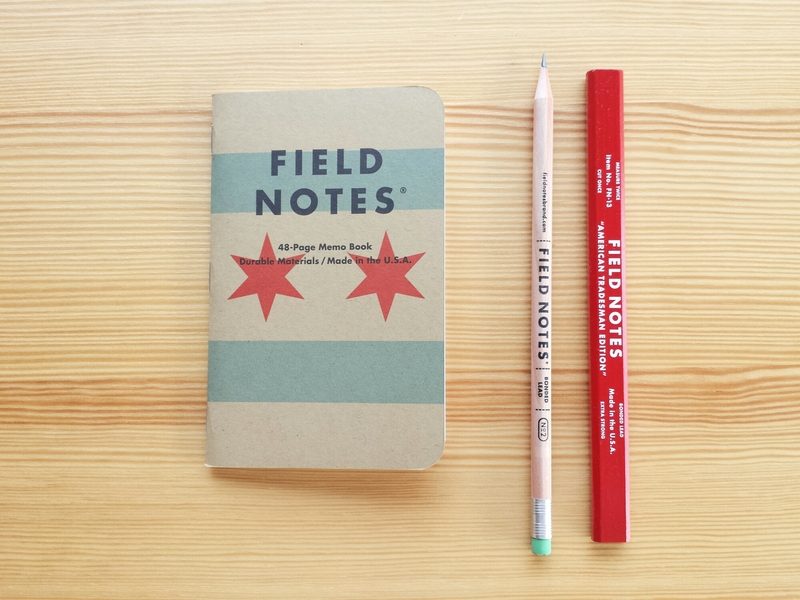 Last week I finally got to join the legions of Field Notes users, thanks to a kind friend. After all this time! I first encountered the bewildering FN phenomenon upon joining the blogosphere, and while I did see a few specimens in my local stationery store in Montreal, I never got around to buying them for myself. Now that I have one in my hands, I find myself struck above all not by its design or paper quality, but by its dimensions. I’ve never seen a notebook in this particular size before. 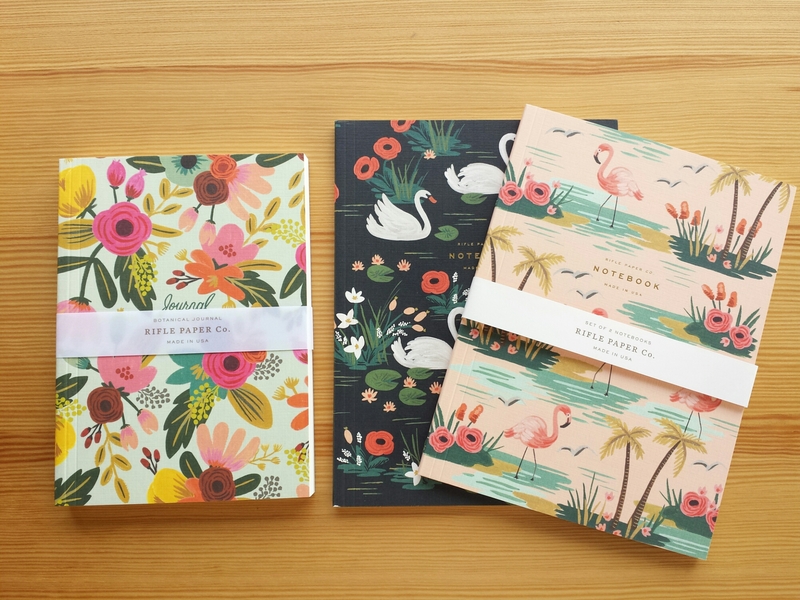 And I’ve been thinking about why this should throw me as much as it does, when notebooks are free to come in all shapes and sizes. For starters, a Field Note is really small. And thin. And tallish, considering its other dimensions. It says 48 pages, but that means 24 sheets, or, rather, twelve sheets folded and stapled in the middle. I’ve never seen a notebook that cries out this loudly to be put in a checkered flannel shirt pocket; I find the shape very masculine. Women’s clothing don’t usually have the kind of pockets to store these in, and if carried around in purses or bags, they would crease right away. This notebook confounds my Asian sensibilities – too thin and undetachable to be a memopad, too small and vertically long to be a notebook. Uncategorizable. 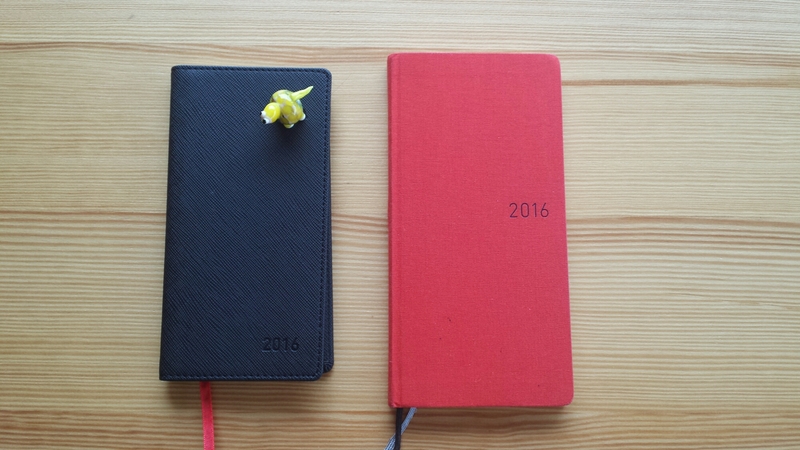 I’ve set the Field Note next to some other small notebooks/memopads I have: the Kokuyo Campus Notebook No. 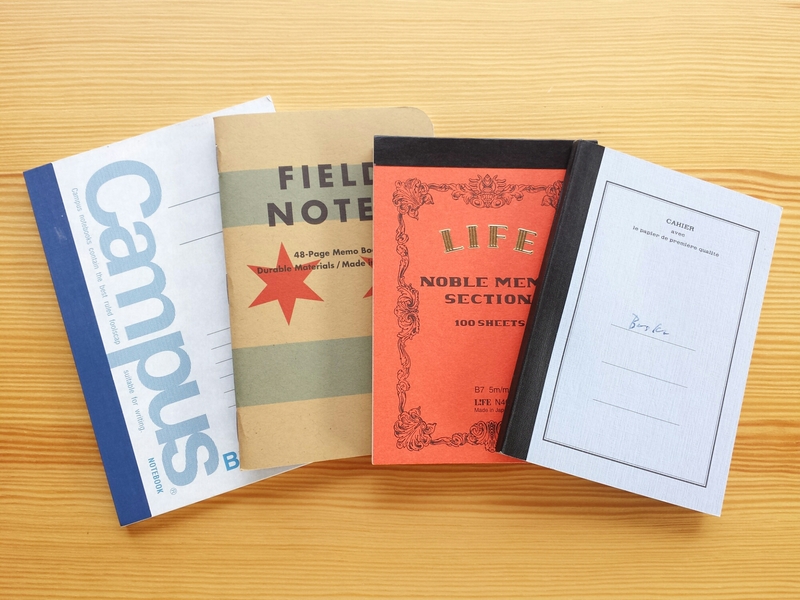 5 (48 pages), a Life Noble Memo Pad (B7, 100 sheets), and another Life notebook (N15b, 40 sheets). In this size, products I’m familiar with usually come with more sheets that tend to be more square and glued together. It’s a distinct advantage of FN’s that the stapled pages lie flat, allowing the user to make the most of the small page. But it has too few pages compared to other premium-quality notebooks of its size; also, while Japanese brands tend to concentrate more on the quality of paper inside, Field Notes is all about design. And the design is undeniably well done; it’s another example of the best kind of Western design, that pulls together a seemingly simple combination of color, texture, and typeface, and achieves something very clean and classic. Thinking about sizes helped me clarify a problem I had for a long time with my Hobonichi Weeks but couldn’t put my finger on up till now. The Weeks is thin, light, portable, and employs this wonderful Tomoe River paper, and I haven’t had any problems using it. However, for some reason, I like it less than my original Hobonichi Techo (planner), and am thinking all the time about what weekly I can replace it with next year. Why? I realized that its dimensions reminded me (however subliminally) of the basic “business diary” so ubiquitous back home and in Japan. 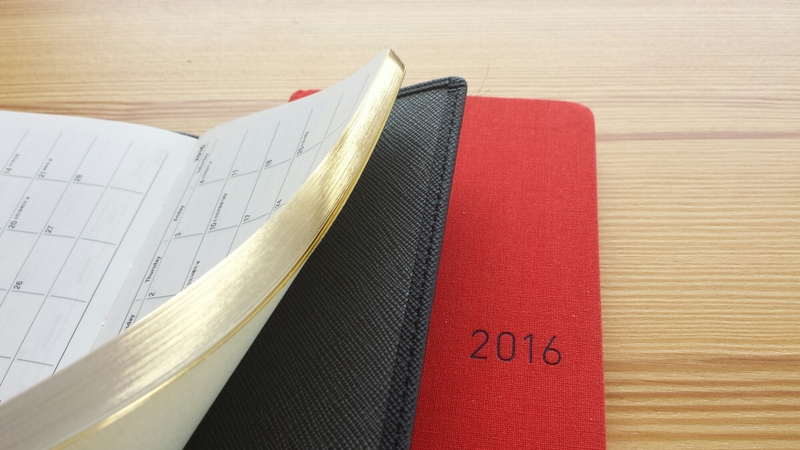 There are two popular formats for “business” diaries: one is in a weekly format, thin, vertically long and has gilded pages, and the other is a larger and much thicker page-per-day diary. Both kinds are produced with vinyl or synthetic leather covers in drab brown or black, and are often issued to employees by corporations at the end of the year. When I was writing up this post I asked my husband whether he had a company-issue diary, and of course he did (seen below next to my Weeks). The actual sizes vary but the general dimensions remain strikingly similar (both kinds of diaries can be seen in this size chart at Takahashi Shoten, a Japanese publisher). I guess the Hobonichi people tried to take the business edge off the Weeks by making it slightly larger and roomier (mindful of the large number of female Techo users maybe?). It’s officially called “wallet size” (and it does match the size of my wallet), but it smacks of crumpled suits and Samsonite document bags all the same. The Nikkei starts its review of the Weeks with the sentence, “The business diary that Hobonichi, with its philosophy of mixing work and leisure, came up with is in a left-sided weekly format…” So for me, long and thin equals “official” and “business”, whereas more square formats signal “laid-back”, “relaxed”, and “private”. I think the size factor also underlies the almost universal affection for the original Hobonichi Planner. It’s a standard A6, 105mm-by-148mm format, but more importantly, this is exactly the size of Japanese pocket books (bunkobon). Non-Japanese users of the Techo don’t seem to grasp the full significance of this size even when told of it, because in the States, “pocket-sized” paperbacks actually come in several different sizes (all larger than the standard Japanese one) and use coarser paper which make for a thicker volume. All in all, American paperbacks don’t look or feel much like notebooks. 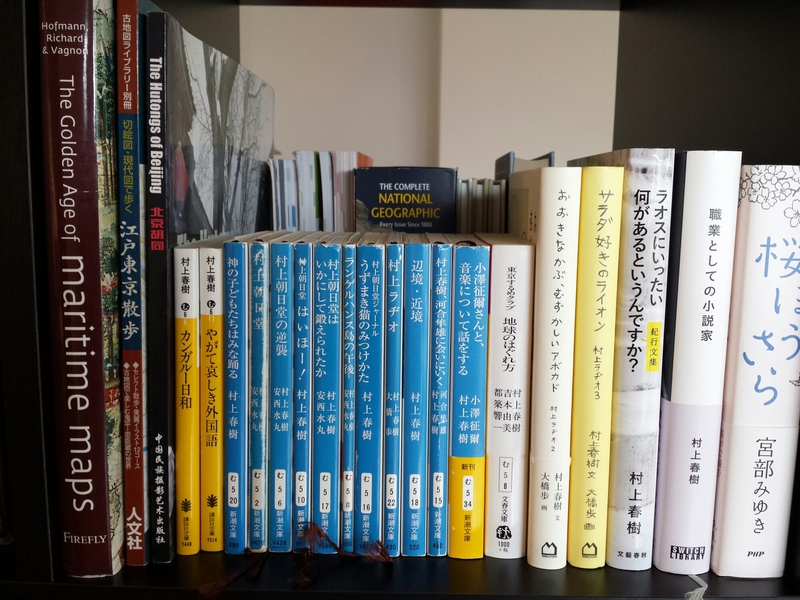 However, Japanese paperbacks are tailored to a much more uniform size across publishers, use smoother, thinner paper (and are therefore more compact), and more popular in their home country. The bunkobon is an immediately recognizable and beloved format. In Japanese bookstores, the bunkobon shelves are allotted by publisher, and the row upon row of precisely matched, color-coded small books can be a sight to behold. Here is a sample row of bunkobon (in the middle), with regular hardcovers on the left. 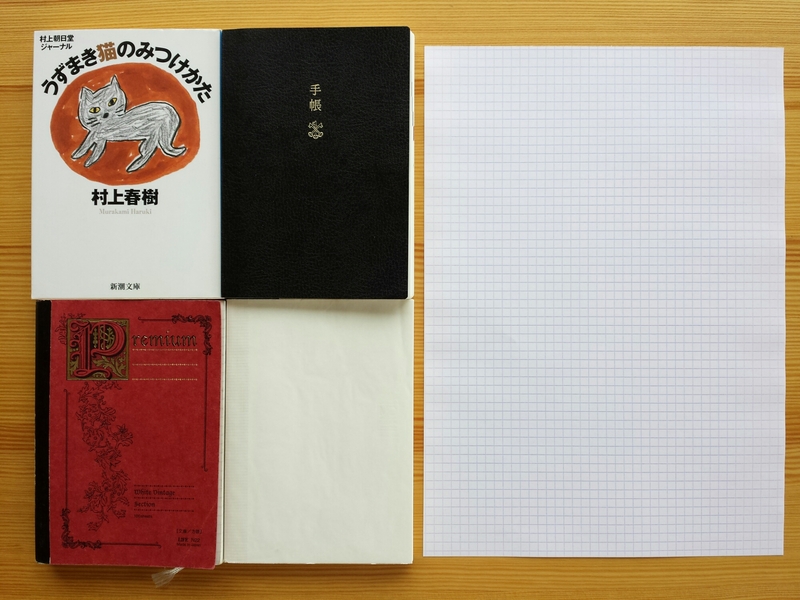 The bunkobon is 1/4 of an A4-sized sheet; top left is a collection of essays by Haruki Murakami, top right is the Hobonichi Planner, bottom left is a Life Premium notebook, and bottom right is a Midori Cotton MD notebook. Given this background, I am naturally interested in other A6-sized notebooks, such as these Kokuyo “Buncobon” notebooks that JetPens is offering (but I’m not ordering them, as shipping alone costs $47!). Muji seems to make some out of recycled paper too. It was interesting to read the comments, though, for the former. People seem to dislike the soft covers, but in my opinion the soft cover is precisely what gives the notebooks their bunkobon flavor; more durable covers should be found in other, mostly Western brands, such as the Quo Vadis Habana notebooks. The memories of a soft, pliable, and light book are what give these Japanese notebooks their particular appeal.